The next generation of domain names is becoming more and more popular, attracting Internet users worldwide. With new generic Top Level Domains entering the digital space every month for the last several months, the response from the global Internet community has been overwhelming. Registrants are selecting new gTLDs as their web addresses of choice with confidence and hope that those definitive names will provide them with their unique identity on the net. 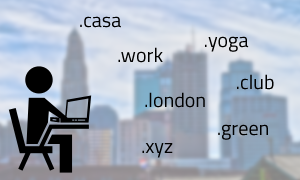 Among recent additions to the already launched domains, there is .YOGA (with 3,833 names registered within the first 24 hours of General Availability), .WORK ( with over 3,500 domain registrations), .CASA (with 1,235 names registered) as well as .GREEN (in Landrush Phase until March 14). More domains are due to be released shortly, all appealing to a target audience. The leader among new gTLDs continues to be .XYZ with close to 800,000 registrations, followed by .网址 (xn--ses554g) (over 350,000 registrations) and .CLUB with about 182,000 names registered. Another category gaining speed is locally-oriented geo domain, like .LONDON, .BERLIN, .PARIS or .NYC. Such namespaces invoke a direct association with a geographical location, ethnic, or cultural community. Now, more than ever, there are countless possibilities of making a presence on the Internet. Just choose the name that defines your needs and check if it is available. Leave the rest to us – we will handle the adminstrative hassle and make sure you get your perfect domain name registered at no time. For local presence requirements, we can provide Trustee Service to make sure you can register even the most exotic domains. If you need assistance, contact us at support@web-solutions.eu.